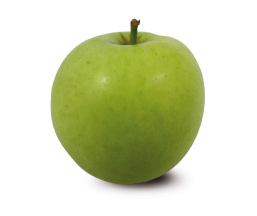 An apple with smooth, greenish-yellow skin. It has crisp white flesh and a sweet taste with very low acidity. Ideal for fresh consumption, in juices, salads and cakes, as well as baked. It is widely used in gastronomy. Harvested in early September, it can be found all year long. 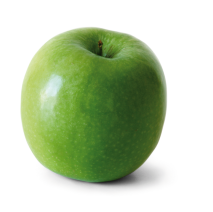 A bright green apple, which may be speckled with whitish spots. Round in shape, it has whitish flesh, a very crunchy texture and a characteristically sour taste. Suitable for fresh consumption, in salads and cakes. Harvested in October, it can be found until the end of June. 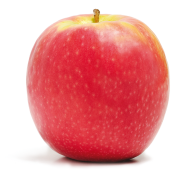 An apple that stands out for its colour: pinkish-red on a pale green background. It has thin skin and creamy-coloured flesh, is highly aromatic, crunchy and juicy. The taste is a perfect balance between sweet and tart. Excellent for fresh consumption and juices. In cooking, it is widely used in salads and to accompany meat and fish dishes. Harvested in November, it can be found until early June. 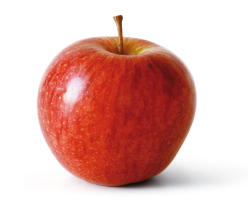 An apple with a light red colour on a greenish-yellow background. 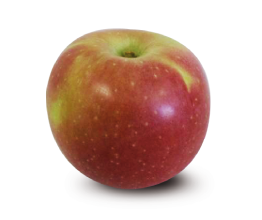 The characteristic qualities of this apple are its creamy-coloured flesh, very sweet taste and crunchy, juicy texture. It should ideally be eaten fresh, but it can also be baked and used in cakes. Harvested in October, it can be found until late June. An apple with an almost uniformly deep red colour. It has whitish flesh, is sweet and highly aromatic. Mainly for fresh consumption, but it can also be used in salads. Harvested in early September, it can be found until the end of June. 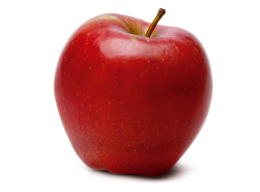 An apple with red stripes on a creamy yellow background. Round in shape with white flesh, it is crisp, sweet and has a touch of tartness that provides the perfect taste balance. Ideal for fresh consumption and in conserves. Harvested in August, it can be found until March.